The motoring world was saddened to learn of the passing last month of three-time Forumla One world champion Sir Jack Brabham, aged 88. Much has been written of his motor racing accomplishments, including 13 pole positions, 13 Grand Prix victories and three Formula One world championships – in 1959, 1960 and 1966. Sir Jack was the only Formula One driver to have won a championship in a car of he built himself. Besides being an icon of motorsport, Sir Jack also had a life long interest in aviation and would often fly his own light aircraft to race meetings around the continent. 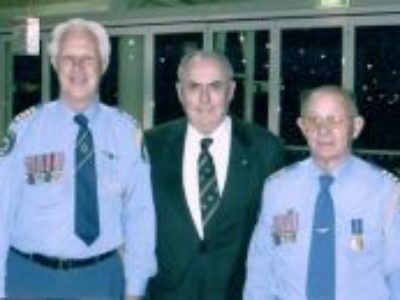 As a young boy he had been a cadet of the Australian Air League before the war, and in 2002 he was a special guest the Australian Air League Review on the Gold Coast where he spoke of his love of flying. Sir Jack became a cadet in the Hurstville Squadron of the Australian Air League, meeting each Friday night at the local Primary School. He had set his sights on joining the Air Force as a pilot but unfortunately this wasn’t to be. At the time he was a guest of the Air League, he still held a pilot’s license but had not flown for a number of years. He had accumulated over 5,500 hours flying and mentioned the highlight for him had been flying a Beechcraft Queen Air from London to Sydney in 1969. Sir Jack Brabham is survived by his wife, Lady Margaret and his sons Geoff, Gary and David.